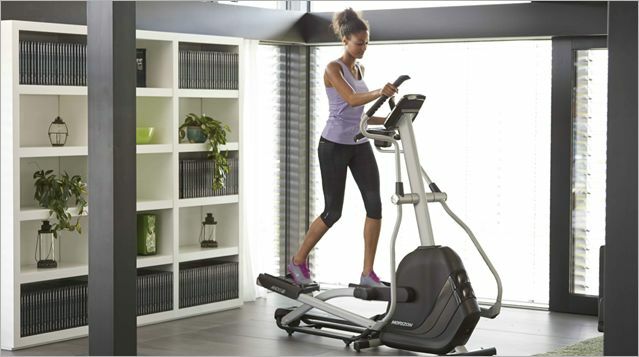 Putting some thought into how you’ll use your elliptical will ensure you’re happy with your purchase for years to come. Asking yourself a few questions will help you decide on the best placement and schedule. When are you most likely to use your elliptical? Morning exercisers tend to be the most successful in sticking with their workouts (fewer distractions at that time of day! ), but a good workout schedule is the one that works for you and your family. Do you imagine using your workout time to catch up on your favorite television series? If so, think about placing your elliptical where you will have a clear view of the TV, perhaps with an extra set of speakers nearby. Also pay attention to low-hanging ceiling fans or light fixtures that block your view or even interfere with your ability to use your machine comfortably. Do you want to be in the middle of family activities or will working out be alone time for you? Placing your elliptical in the bedroom can work well if you’ll be using it mid-morning, but not so great if you need to sweat before your partner is out of bed. You could consider an unusual placement, such as an unused corner of the kitchen or dining room. That way you could work out while the kids do homework and your spouse prepares dinner, and you won’t miss any of the family check-ins and conversations. While you may find yourself simply climbing on and getting started for the first few workouts, you’ll want to consider the long term. A variety of workouts will help you to avoid the dreaded fitness plateau, while heart rate monitoring lets you train smarter for better results in less time. You can even keep yourself motivated with your favorite music.